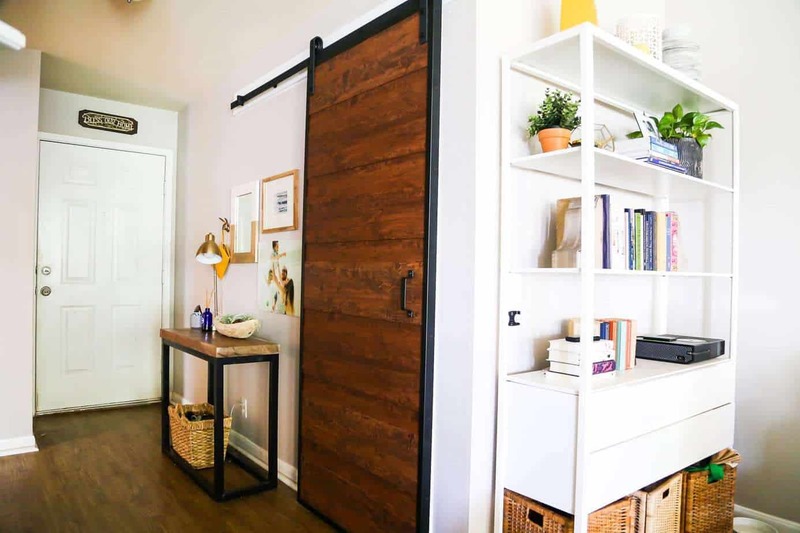 We’ve been talking about replacing our laundry room door with a barn door for quite some time now, and we finally got it done! I’m sharing the details on our new laundry room door, asking for some advice, and chatting plans for our small laundry room! You might remember that one of the things I was the most excited about when we first moved into this house was having a dedicated laundry room. I had never had a real laundry room with a real door before (I’ve only had closets with bi-fold doors) and it made me feel like such a grown-up to have an actual laundry room for the first time. And then? We moved in. We (very) quickly realized that our small laundry room was actually even smaller than we originally thought it was. With our regular-sized side by side washer and dryer, we couldn’t open the garage door all the way because it would bump into the machines. On top of that, our dryer gave out pretty quickly after moving in and we decided to go ahead and upgrade to a new set and go for something stackable. We figured that would solve the problem of being able to open the garage door and would also free up some space for storage on the other side of the room. But then, we had a new problem. Our new washer and dryer were actually slightly deeper than the old ones, and now the main laundry room door wouldn’t open all the way! I don’t have a photo to demonstrate because it was so tight I literally couldn’t get a photo, but every time I wanted to do laundry I had to open the door about halfway (since that’s all it would go), squeeze in with my laundry basket (which got harder and harder as I got more and more pregnant), and then close the laundry room door behind me so I could wedge myself in place and get the laundry started. I did this multiple times a week. For months. And it was just as awful as you’re imagining. 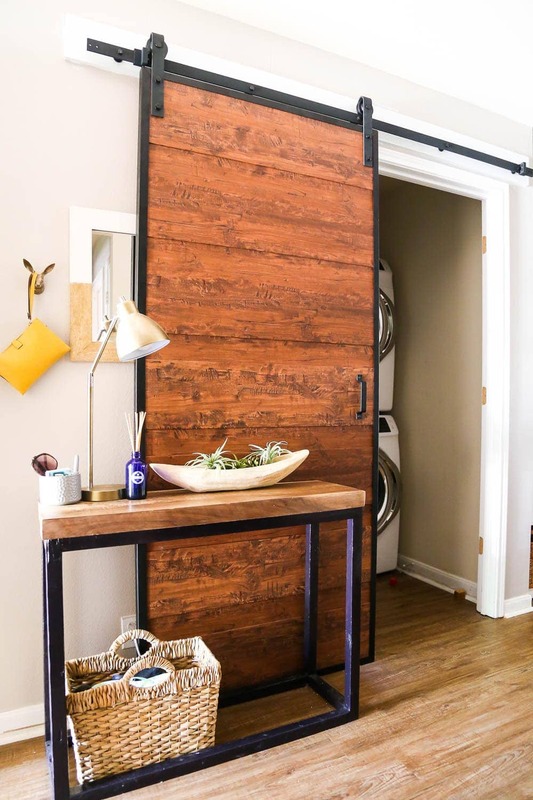 We did a ton of brainstorming and decided that a laundry room barn door would be the way to go. 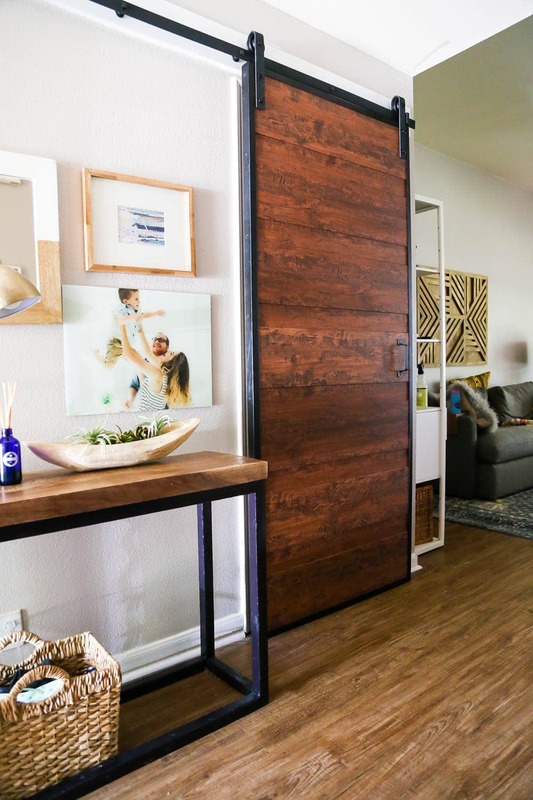 A pocket door would obviously be ideal as well, but that requires hiring someone to tackle it (because that’s a project we aren’t willing to take on ourselves!) and a ton of mess and time and money. We needed something that would slide completely out of the way so I didn’t have to get all the way into the laundry room in order to actually do laundry. 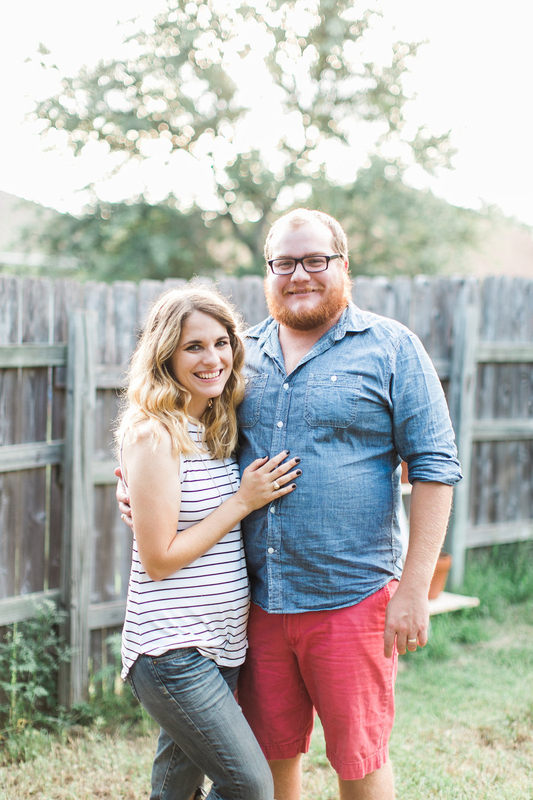 We decided on that plan, said we’d build something soon, and then we got distracted by the dining room and the nursery and Jackson’s bedroom. And all the while I was getting larger and larger and growing more and more frustrated by the day with the laundry room door situation. So, when we were at Lowe’s grabbing some wood for a project and we happened to see an open-box barn door that had been returned, we were intrigued. We looked it over thoroughly in the store and determined that one piece was missing (the piece that holds the door close to the wall at the bottom and prevents it from swinging when you open it), and one piece was damaged (the wooden piece that goes behind the track at the top of the wall), but we knew that both be easy replacement pieces to find. The door was 60% off since it had been opened, so we scooped it up immediately. We got it installed last weekend and I have to say I am so thrilled with the finished result. It looks gorgeous, it’s so much easier to do laundry, and I feel like we’ve taken the first step towards maybe turning our tiny laundry room into something that’s more functional for our family. The only dilemma that we’re dealing with at this point is the entry table. As you can see, in order to allow the barn door to open, we have to have the table scooted several inches away from the wall. I asked on my Instagram stories if this would bother y’all, and you were very divided on the issue. About half of you said it was no big deal and I’d get used to it, and the other half said I must get rid of the table immediately! I’m undecided on how I feel about it at this point. 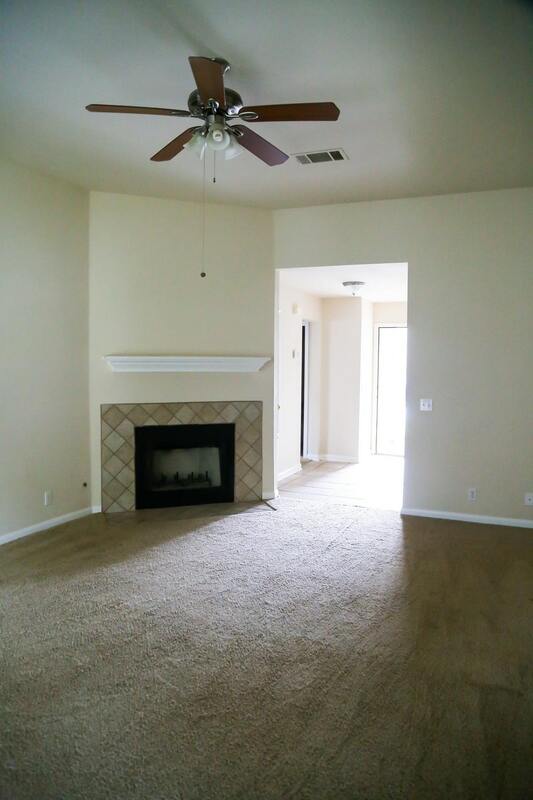 We’re currently in the “live with it for a while and see what we think” phase, but I feel like the entry would look pretty empty and sad without any furniture at all in it, and anything that I put there will need to float away from the wall a few inches to allow room for the door. Currently, I’m ever so slightly leaning towards the “we’ll learn to ignore it” camp, but if there’s a genius solution that I haven’t thought of yet, I’d love to hear it! The laundry room definitely isn’t high on our priority list right now (we’re still working in the nursery and the garage, and the next major room makeover we do will be the kids’ bathroom – hopefully early next year! ), but I do love dreaming about what we might do in there someday. 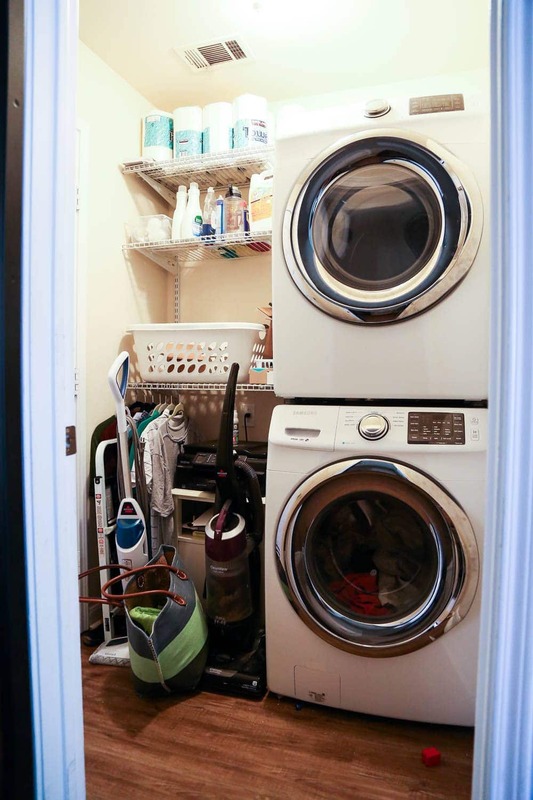 I shared a few favorite small laundry room ideas right when we moved in, and many of them are still high on my list of things to try when we do tackle this room. I think we definitely need more functional storage and organization, and I’d love to make it at least a little bit cuter! What’s your laundry room situation? Do you have a spacious room that you love, or are you stuck with a tiny and awkward laundry room too? What about if you moved the table, left up the wall decor (maybe you could add a sconce or lamp as well if the area needs light? ), and put a coat rack and large basket or the current basket and a large plant on the floor? Then the space wouldn’t feel empty, but those things wouldn’t necessarily take up a lot of space and wouldn’t feel awkward moved away from the wall. I can picture this in my head, but I’m not sure if I’ve communicated it well here! If it was me, I would leave the entry way table. I think it adds to the wall as a whole open or closed. Good luck with whatever you decide! Thanks, Vicky! I’m starting to lean towards some sort of combo – removing the table but changing up the room to keep the functionality. We’ll see! I agree with the other comment – remove the table. I think it’s competing too much with the door for the focus of the wall! I would maybe add hooks or narrow shelves closer to the front door (or maybe a coat rack?) and possibly add more to the gallery part of the wall. I’m sure you can find another home for your entry table in your home, too! Y’all are giving me a lot to think about!!! I think if you can do without it, it would be better to get rid of the entry table and just have wall decor there that goes behind the door when it’s opened, like you do now. From the first picture in this post, it looks like the table crowds that space a little anyway, and having to float it out just cuts more into the hallway. One idea I had was to add a large decorative mirror there that would go behind the door when it’s open. Cool door! I would get rid of the table in favor of a couple hooks to the left for things. Also – have you thought of painting the wood of the door white? Might open things up even more! Thanks! That’s a possibility! Right now we’re planning to just live with it for a little while, but we could paint it down the road! The opposite wall is very small – there’s a large A/C vent and a door to the utility closet! 🙁 I’m definitely considering maybe moving a small table over there, though – you guys are giving me a lot to think about!